Owned by game enthusiasts, Off the Charts Games was founded August 2011 with the purpose of celebrating the fun of board gaming in a family friendly atmosphere. We enjoy sharing our passion for games and puzzles at our location in historic downtown Gresham. Our games run the gamut from 10 minutes of silly fun to several hours of head scratching strategy. Our Games Library has a wide variety of games available for play. When you stop in, we will be happy to demonstrate some of the most popular games today and introduce you to many new games. Don't take our word for it, read what the papers say about us! "...a store dedicated to board games in the video game era is a challenge. Fortunately, that's exactly what the Browns were after. After working as accountants for years, they were ready for something entirely different. "We decided we had enough of 60-hour weeks behind PCs crunching numbers," Ron Brown said. The couple have lived in Gresham for 27 years, and they settled on the city's downtown for the store's location because of the easy commute and the incentives the city offers for small businesses. While the popularity of Euro-style games is important to the store's bottom line, not all of the games at Off the Charts Games are from across the Atlantic. A few are even local, such as Redneck Life, made by Gut Bustin' Games in Battle Ground, Wash., and Bridgetown Races, where players race around Portland's bridges capturing flags. "When we find something with a local flavor, we'll bring it in," Ron Brown said. 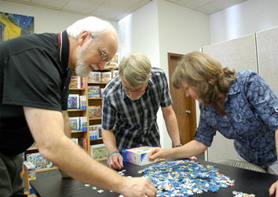 Ron and Lynn Brown, the owners of Off the Charts Games, and their friend Lloyd Hammer put together a 1,000-piece puzzle. The couple say they have reviewed 1,500 games to stock the store with about 200. Two tables are used to demonstrate games, and another table is reserved for customers to play in the store. The Browns are planning to host tournaments once they settle in. "When people come in, we're here to help them have a good time whenever they want to play that game," Lynn Brown said. Despite being open for only a few weeks, they already have some regulars. "We've been open four weeks, and they're coming in every week," Ron Brown said. "We order weekly. One of our goals is to have something new all the time." Card games like Bohnanza and Fluxx are scattered on tables, patiently waiting for players, while Civilization: The Board Game, and Ticket to Ride beckon those looking for more of a challenge. Gone are the days of sitting around a table with a wad of Monopoly money or Colonel Mustard and the wrench. The store is a second career for Ron and Lynn, who were corporate accountants before retiring in 2008. They spent three years researching the board-game industry and reviewed more than 1,500 games before deciding on what would occupy their shelves. Both grew up with classic American board games and spent several years playing Pinochle and Canasta with family and friends. They discovered the world of Euro-games in the early 1990s by accident..."